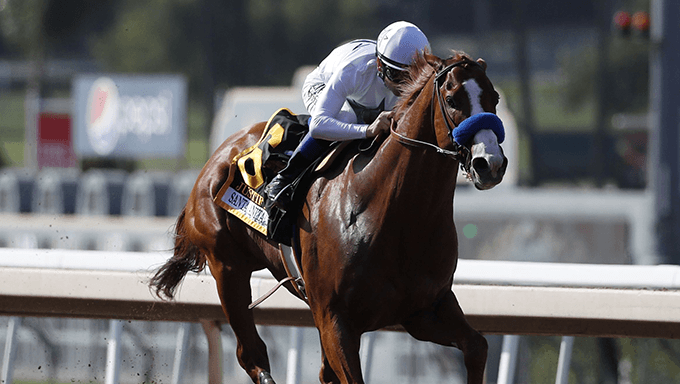 Belmont Stakes 2018 Betting: Justify to Win Triple Crown? The Triple Crown has always been the holy grail of horse racing. From the first winner Sir Barton way back in 1919 to the most recent victor American Pharoah just three years ago it’s an achievement that all owners and trainers strive for and to ride a Triple Crown winner is the ultimate achievement for any jockey. The series is a sequence of tough races, starting off with the 1m2f Kentucky Derby in early May, followed by Pimlico’s Preakness Stakes over an extended 1m1f and the concluding leg over 1m4f, the Belmont Stakes. In the modern era it is that hard a sequence to complete that between the penultimate Triple Crown hero Affirmed in 1978 and the most recent, American Pharoah in 2015 thirteen horses tried and failed to complete the ultimate test. There have been many different ways of losing the final leg, from Real Quiet being reeled in having entered the final quarter mile with a four length lead in 1998 to Charismatic faltering yards from the line just a year later. Justify heads into the 2018 Belmont Stakes like many other would be Triple Crown winners before him, the impressive winner of the first two legs and with a slight doubt surrounding his stamina and ability to handle three tough races in just over a month. With that in mind it’s worth looking at a few of his likely rivals in the big one, most notably the likely second favourite Hofburg (9/2 with William Hill). Owned by Juddmonte Farms the colt ran well to finish runner-up in the Florida Derby at Gulfstream Park at the end of May and while he eventually finished well held by Justify in the Kentucky Derby early last month his breeding offers hope that he may well be able to reverse that form over the extra quarter mile. Hofburg’s sire Tapit has already produced two Belmont Stakes winners having sired Tonalist the winner of this race back in 2014, a year in which he put paid to California Chrome’s Triple Crown aspirations in the process. The grey’s other Belmont Stakes victor came when Tapwrit stayed on strongly to win going away in this race a year ago. Tapit is rapidly running into a force to be reckoned with come this time of year and anything that represents him over 1m4f has to be respected. Tenfold (12/1 with 888sport) is another possible opponent on Saturday with Tapit blood in his lineage this time via his dam Temptress, a daughter of the prolific sire. Tenfold sprung something of a surprise when staying on into third beaten less than a length by Justify in the Preakness Stakes last month. With the step up in distance likely to bring about improvement he represents another barrier in Justify’s quest for a Triple Crown. Bravazo (8/1 with Coral) burst onto the scene when placed in a Grade 1 contest at Keeneland in October last year and while he bombed at the subsequent Breeders Cup meeting at Churchill Downs he has got his career back on track since with the highlight among his subsequent victories being a Grade 2 success at Finger Lakes in February. Trained by Hall Of Fame inductee D Wayne Lukas the colt came within half a length of Justify when finishing runner-up in the Preakness having previously finished sixth in the Kentucky feature a month ago. D Wayne Lukas has taken the Belmont four times including three times in a row from 1994 to 1996 with his most recent victory coming when Commendable sprung a shock in the race eighteen years ago. Blended Citizen has gone under the radar somewhat in relation to his rivals having skipped both Triple Crown races run so far and he put in a bold show when notching a Graded stakes success over a mile at this track last time out. He’s available at 16/1 with Paddy Power with the bookmakers and he would be less stoutly bred than some of his rivals while his half-brother Lookin At Lee finished well beaten after a trouble passage in this race a year ago. Gronkowski (40/1 with Betfair Sportsbook), named for the New England Patriots tight end of the same name comes into this following something of an unorthodox preparation having spent the early part of his career with Jeremy Noseda in the UK. Plans for a Kentucky Derby challenge were thwarted late on and he could become the second ex-European-trained winner of this race in recent years with Sarava having taken this contest in 2002.